Darussalam Gontor Modern Islamic Boarding School (Pondok Modern Darussalam Gontor) is one of the Islamic boarding schools located in Gontor Village, Ponorogo Regency. 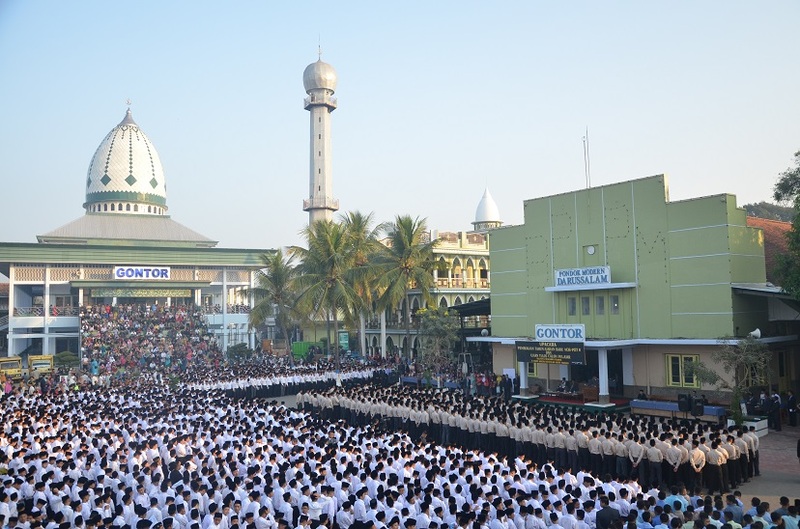 Darussalam Gontor Islamic Boarding School was founded in 1926 and is famous for the modern pesantren education system by applying high discipline, leadership, and mastery of foreign languages ​​(Arabic and English). The purpose of Gontor's education is to form a person of faith, piety and moral character who can serve the people with sincerity and play an active role in empowering the community. For this reason, since its inception, Pondok Modern Gontor has declared that "education is more important than teaching". Pondok Modern Gontor educates students to live simply. Simplicity that means living a natural and not excessive lifestyle. Simple does not mean passive, it does not mean poor or destitute. It is precisely in the spirit of simplicity that there are values ​​of strength, ability, fortitude and self-mastery in the face of struggle for life. Simplicity does not mean poor and does not mean educating to be poor, on the contrary, simplicity allows santri to live honestly and cleanly, qanaah, and healthy physically and spiritually. Behind that simplicity is the power of determination, steadfastness, tenacity, and a sense of concern for suffering. Pondok Modern Darussalam Gontor has the attitude that education is a means for the Thalabul Ilmi, and not a means to obtain a certificate so that it can become an employee. This is reflected in the steps of Pondok Modern Gontor to educate students with mental skills-based education. Pondok Modern Gontor believes that with strong mental skills, the santri have a high spirit of independence. In general, schoolchildren will always use bags to carry books and stationery. However, this habit is not seen in the daily lives of Darussalam Gontor male students. All stationery equipment or other worship equipment are carried by hand or if there are large numbers of them will use plastic bag. In carrying out daily life in Islamic boarding schools, student are required to use two types of languages, Arabic and English. In one month, two weeks are dedicated to Arabic and the next two weeks are in English. During the Arab or English week, each student is obliged to memorize three vocabulary words per day. Monitoring of language use will be carried out by their own friends who are currently serving as Jasus (secret agents). For those who commit violations will get a punishment according to the level of violations committed. In the lives of student in Pondok Modern Darussalam Gontor, there are two types of violations. The first is language violation. Not using a language that is being used in a particular week is included in this type of violation category. Mixing between Arabic and Indonesian will also be recorded as a violation. They are required to use the language that is being used during the week, starting to wake up until to sleep again. The second type of violation is a disciplinary violation. Too late, leaving the boarding school complex without permission, and other violations that have been determined in accordance with the rules in the boarding school will fall into the category of disciplinary violations. Generally, the punishment is given to student who commit violations in the form of Jundi (bald) punishment (shave off his head hair). Punishment will be determined by "Mahkamah", the committee tasked with providing evaluation and determining the type of punishment. For the student who returned to committing a violation when their hair had not yet grown due to a previous punishment, then he would be have a credit to a bald penalty. When his new hair grows, it will be shaved off. Another form of punishment for student who do the violations was the assignment of being a secret agent or termed Jasus (spy) among the student. Jasus has a mission to spy on other student and record their violations. Usually a Jasus has a target of collecting three violations. Jasus is a scourge for student because of the confidentiality of the mission he carried out and the difficulty in identifying Jasus's whereabouts. Not infrequently without realizing it turns out that roommates are getting a special mission as Jasus so as to make every santri always alert not to do violations of either language violations or security violations (discipline). The students are not allowed to bring an iron. Therefore tidying clothes is a challenge for student. They must be able to find other ways besides using an iron. Under this condition, student did not run out of mind. Some student said that they tidied their clothes and sarongs using large books or dictionaries like Oxford dictionary. They attach or overlay the folds of clothes or sarongs with Oxford for the whole night. Another technique is use cartoons obtained from the new clothes which are then stored to fold the clothes to be worn the next day. Prayers mat are always a daily part of the student. Every student is required to bring prayer mats especially when the congregational prayer time arrives. The use of prayer mat has its own peculiarities depending on the position in the boarding school (administrators / non-administrators). The administrator will use a large prayer mat. While ordinary residents will use a smaller size. In addition, laying a prayer mat will also be determined by certain positions within the student organization. Especially for those who sit as security, are required to use large size prayer mats and placed on the left shoulder. While other student put their prayer mat on the right shoulder.